After losing faith in their previous designer we worked with Street Kings UK to create a fresh, new visible brand, customised SharePoint 2013 intranet, WordPress website with a stable email system on Office365. 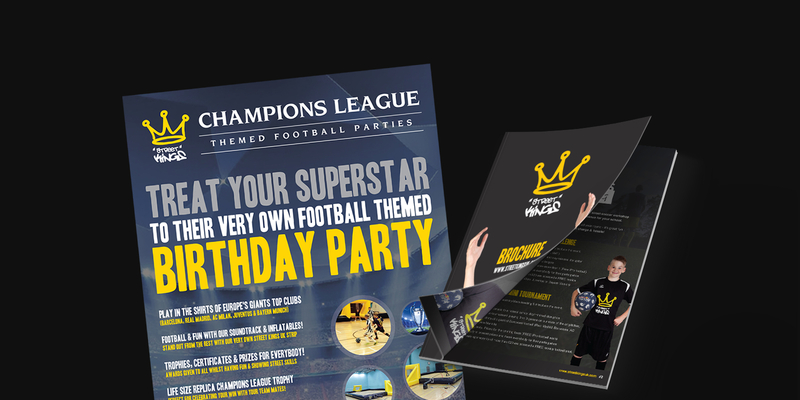 Street Kings UK based in Telford, Shropshire, are a football events company that focuses on putting the fun back into football coaching, fundraisers & birthday parties. After slightly changing the logo we then set on a path of tying together the brand. We built a brand new website powered by WordPress to enable the client to content manage and powered the internal business with Office365 using it for email & SharePoint for their new intranet called "The Dugout". We also produced a vast range of marketing materials such as brochures, posters, leaflets & a range of fun guides for kids! We essentially took a step back and looked at the logo & the entire branding. We soon saw that it was muddled, we looked at where they are now and where they wanted to be and reproduced a fresh, solid brand that is recognisable without limiting the company to a single industry. Previous the client was unable to update their website, blog or even change content. With WordPress this changed, the client can now update the content on their website as and when needed and blog about various subjects around kids, learning & football. For them this was an easy to use, manage and importantly a cost effective solution. We sat and worked with StreetKings UK to understand their business strategy for the next 6months to a year and how the marketing strategy would align with that. We set a series of marketing milestones to achieve the growth that was needed. This was important to ensure cash flow was healthy as well as letting the business grow in a manageable way. One aspect we enjoyed was sourcing garments for their uniform as well as childen's football kits and apereal to sell as another arm to the business. Sourcing a local printer & embroiderer we created a range of t-shirts, snap back hats, beanies and training wear & football kits. With plans to expand in the coming months it was important that Street Kings UK can a platform that could do the same when needed, which is why we used Office365. We set up up a stable email solution that could be sync across devices as well as being accessible by all staff whether they were in the office or not. We created a SharePoint 2013 intranet called "The Dugout" and branded it to tie in with the branding work. We created a masterpage and a range of page templates for different teams and used out of the box SharePoint 2013 functionality to enable document sharing, collaboration & communication within the company. Street Kings UK's new website not only improved their marketing & overall business, their intranet has improved internal processes. We continue to work closely with Street Kings UK to ensure brand integrity & the creative ideas keep coming, something they haven't had before. The reliable partnership between us enables us to work with a fantastic team and a great start up business to help them grow and take the Street Kings UK brand to the football mad children of Telford, Shrewsbury & Stafford. "The work the guys at PinkPetrol have done are nothing short of amazing. The ideas, creative direction & help they have given us has enabled our business to start on a solid platform and go from strength to strength."